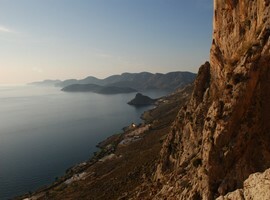 If you are a fan of the rock climbing then the Island of Kalymnos is your place. Kalymnos is an island close to the Turkish coasts and located between the two islands of Leros and Kos at the northern side of the Dodecanese. The island is covered by rocky mountains and is an ideal place for the rock climbers. 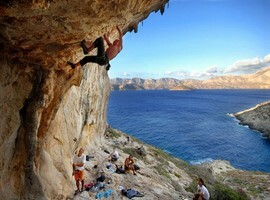 The most dedicated rock climbers visit this island every September to enjoy the International Climbing Festival. There are several relaxing resorts constructed on the beach front. The tourists love to stay near the beach to enjoy the activities there. For those who want to go wild, there is a small island near Kalymnos which is called Telendos and is famous as a nudist beach. Pothia, the island’s capital is full of sponge sellers. 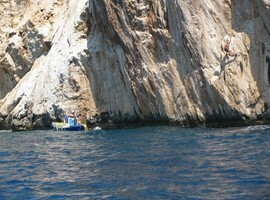 Sponge harvesting is the main source of income at Kalymnos. Previously the residents of the island used to earn their living by the sponge fishing but now there are other resources too. However, Pothia is still a home to sponge sellers. The fishermen and divers every day risk their lives by diving deep down in the dark blue sea of Kalymnos to discover the hidden treasures of Sponges. The local fishermen are well aware of the seabed and its surroundings, so every day they bring out the sponges to the surface and sell them in the market to raise their finances. These valuable harvested sponges are then sent for selling to Constantinople(Istanbul), Nafplio and Syros. The local tradesmen even send them to far areas, such as the Middle East, Moscow, Odessa, Trieste and St. Petersburg. Kantouni with the golden sand and the clean beach is a loveable tourist spot. The long sandy beach of Kantouni is located 5 km north west of Pothia. From the beach, you can even have a glimpse of the beautiful Holy Cross Monastery standing on the top of the mountains. The beach can be found crowded sometimes as it is at a walking distance from the Panormos and the locals like to spend their evenings on the beach. There are some good places for accommodation, including the popular Kantouni resort, taverns and the roadside cafes. The pleasant atmosphere and the wide variety of the modern facilities, make Massouri the most famous beach in Kalymnos. 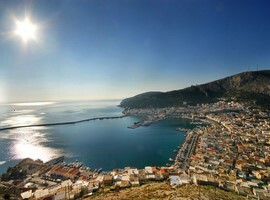 It is placed at a distance of 9 km from the capital of Kalymnos, Pothia. The beautiful beach is surrounded by a village, which is equipped with all the modern facilities and works as a resort for the travellers. The sandy beach front is filled with umbrellas and sun beds to lie down and enjoy the refreshing breeze. Number of bars and cafes are also open in the village. The visitors love to take part in the water sports activities and it remains crowded during the high season. For a boating experience, canoes are also available here for the tourists. The perfect sun bathing experience can be enjoyed on the pebbled shore of Myrties beach. The beach is located in the north-west part of Pothia; at a distance of 8 km. Tourists like to swim in the fresh, warm water of the beach. Fine taverns, cafes and other comfortable accommodations are also available in the village. At a distance of 6 kilometres from the town of Pothia, in its north western side lays the mesmerizing beach of Linaria. You can observe amazing rock formations that have emerged from the sea. The warm sandy beach front with the crystal blue water make the beach an exotic vacation place for all of you. As compared to Kantouni, Linaria is less crowded and one can enjoy a relaxing day with swimming and other water activities with peace. To get better accommodation you need to walk a bit till Kandouni and Panormos. However, the Linaria beach has cafes and tavern for some entertainment. The town of Pothia is brilliantly constructed amphitheatrically around the port. 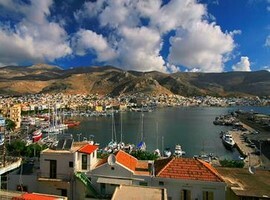 The town of Pothia also serves both as the main port and the capital of Kalymnos. The town is beautifully built on two hill slopes and some of the parts of the town slander in the lush green valley. It is very well equipped with modern facilities, such as banks, open air cinema, shops, cafes, taverns and a cultural centre. The total population consists of ten thousand people and most of them are associated with the profession of tourism and sponge fishing. Pothia if seen from far looks like a painting. The vibrant coloured houses, the wooden balconies, the coloured doors, the shutters and the beautiful narrow passages give to the place a breath-taking beauty. The visitors love to walk around the town and enjoy their time in shopping and walking from one shop to another. The town colour becomes more beautiful when the colours of the valley are added in it. The vibrant valley portrays an enchanting landscape. While walking on the street, you will see some really old churches, well-preserved buildings and graceful mansions. There are some major attractions in the nearby areas of Pothia town. The Archaeological Museum is one of them, where significant findings are revealed for its visitors. Two more museums, the Maritime Museum and the Folklore Museum are also located there. Kefala’s cave, the Church of the Christ and the Chryssoheria Castle are some worth mentioning places. The village of Kantouni is situated in the north western part of Kalymnos, at a distance of 5 kilometres from the capital town of Pothia. It is a peaceful village and the tourists love to visit the place thanks to its closeness to many immaculate beaches. The stretched beach front has many appealing taverns, hotels and bars, where the mouth watering local cuisine is served with a delicate taste of herbs. The lush green scenery, the shallow waters and the steeped landscape create an enticing effect for the residents of the island –permanent or temporary. The locals are very welcoming and full of warm hospitality. From the main port of Pothia, at a distance of 8 km lies the beautiful Myrties village. The village is full of the embellishing myrtle-trees and that’s why it is called as Myrties. The narrow passages are filled with beautiful traditional houses and the impressive sight of the hills rising at the back of these houses give the village a scenic beauty. 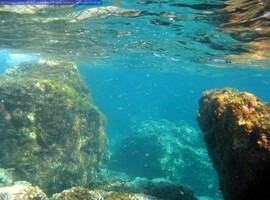 Myrties also serve as a base for visiting the Kefala Cave, Telendos Island and other closeby beaches. The ferry services take tourists from Myrties to their desired destinations. The village has some places for accommodations, cafes and restaurants. 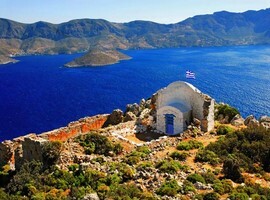 Most of the tourists love to visit Telendos Island too, as it is only five minutes away by boat from the Myrties beach. Vathy is located at a distance of 13 kilometres from the town of Pothia. It is situated in the centre of a valley and is considered as the most productive part of the island. The slopes of the two hills and some part of the lush green valley are covered by beautiful houses and narrow alleys. The clear waters attract tourists for swimming and sunbathing while the striking bay of Akti and Vathy is ideal for such purpose. Some interesting visiting places include the Monastery of the Virgin, some nearby caves and the ruins of an old castle. The air around is full of the smell of the orange and citrus trees. The beautiful oasis offers also fishing boats and tourist boats for visiting the nearby sites of the island. It also has some good quality facilities for accommodation and taverns for eating. Delicious meals are served in the local taverns and restaurants with mouth-watering taste. If you are planning to travel to Kalymnos by air, then you need to plan your holidays for the summer. Yes, because the Kalymnos airport is open only during the summer months. You can take the domestic flight from Athens and reach your destination in an hour. However, you should not be worried as apart from the airplanes, you can also reach to Kalymnos by a ferry. In 3 days a week, the ferry carries the travellers to Kalymnos from the port of Piraeus. You can even try the local ferries that can take you from the island of Kos to your desire island of Kalymnos. The island is connected by ferries with some other islands too, such as Leros, Rhodes, and Patmos.